Dylan Thomas, a linebacker at Pike County High School, was injured on Friday. By Jared Grossman and Shamard Charles, M.D. A Georgia high school football player has died after suffering injuries during a game, school officials said Monday. 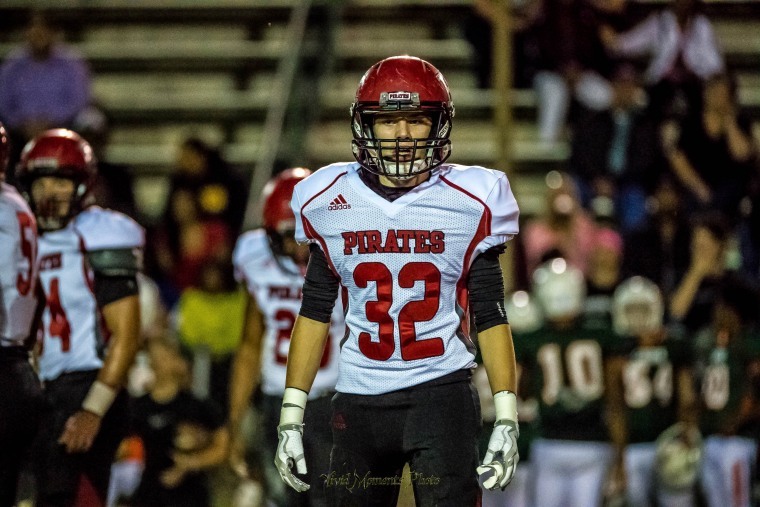 Dylan Thomas, a 17-year-old linebacker at Pike County High School in Zebulon, suffered a head injury during the game on Friday. Thomas, a junior, was hit in the second quarter of the game and later collapsed on the sidelines when an arm and leg went numb, an uncle, Nick Burgess, told The Associated Press. Thomas was rushed to a regional hospital before being transferred to Grady Memorial Hospital in Atlanta, where he underwent surgery. According to a Facebook post by Burgess, Thomas' brain swelled and he went into a coma. He died Sunday evening. The exact moment of impact is still being investigated by Athletic Director James Stanford and Coach Brad Webber. "We have the video, we're evaluating the entire thing. It wasn't anything that stuck out, we're still reviewing it," Webber said at a news conference on Monday afternoon. "As we can tell right now he was not involved in a tackle. He was coherent, able to speak when he came to the sideline." News of Thomas' death inspired friends, students and others in Zebulon to flood social media with tributes to Thomas. A donation page started by Burgess for medical costs and lost income had raised more than $32,000 by Monday afternoon. "We held prayer vigil in the courtyard. The whole group is tight knit, it's rough, it's devastating. Dylan was one of the finest young men I have ever met in my life," said Webber. Stafford added, "He had a work ethic that you wouldn't believe. He was the heart and soul of our defense." "Dylan was an active participant in our school community and a member of the Class of 2020. Please remember his family in the days ahead," Michael Duncan, superintendent of schools, and Kevin Huffstetler, Pike County High School principal, said in a joint statement on Monday. Thomas's death comes as Tennessee State University linebacker Christion Abercrombie was recovering from emergency surgery after a head injury during a game against Vanderbilt University on Saturday, AP reported. He remains in critical condition at Vanderbilt University Medical Center. Abercrombie walked off the field without any assistance, and told trainers that he had a headache. Minutes later, he collapsed, his coach told The Tennessean. Recent injuries in high school, collegiate, and professional football have opened a debate over whether stricter safety regulations are needed. And some parents question whether teenagers and young children should be allowed to play football at all. A poll earlier in the year conducted by NBC News found that 48 percent of Americans say they’d encourage a child who wanted to play football to play a different sport due to concerns about concussions. In 2016, an estimated 982,000 children ages 6 to 12 played tackle football, according to a Sports and Fitness Industry Association survey conducted on more than 24,000 individuals and households. That is a 1.8 percent drop from 2011, although another survey showed that participation in flag football was up 8.7 percent from 2014 to 2015. Last year, a long-term study by researchers at Boston University found that athletes who began playing tackle football before the age of 12 had more behavioral and cognitive problems later in life than those who started playing after they turned 12. One common football injury is concussion, which several studies have linked to chronic traumatic encephalopathy (CTE), a degenerative brain disease found in athletes, veterans and others with repeated brain trauma. But recent research has shown that repetitive hits to the head, even those that don’t meet the definition of concussion — meaning no loss of consciousness or headaches, dizziness, vision problems or confusion — may cause CTE.